A non-Urdu speaker who has been taking part in Hindi oratory contests for the past three years wowed the crowd yesterday. Rosheel Chand of Nadogo Central College won the senior category for the Northern Division Urdu oratory competition and it was the first time he took part in the competition. He becomes the first non-Urdu speaker to win the competition. Rosheel said he had never learnt or spoken Urdu before, but he was confident after winning the Hindi oratory contest earlier in the year. “I feel very happy to be the first student from my school to win this competition where eight secondary schools participated,” the Year 12 student said. His speech focused on the role youths could play in the development of a society. 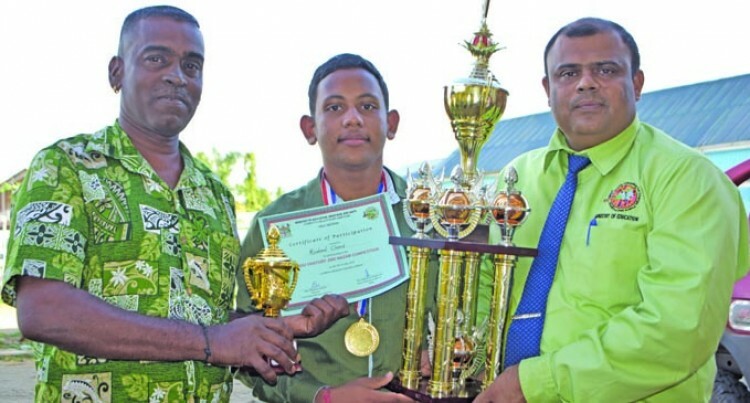 School principal Mohammed Khan was emotional after Rosheel’s achievement. He said this was an eye opener for all schools to always give exposure to every child for holistic development. “In our school we don’t offer Urdu subject, but we thought of giving the students the opportunity to show interest,” Mr Khan said. “We should respect all religions and cultures. “I would like to thank the school management, teachers and Rosheel’s parents for their support. The competition was organised by Ministry of Education.